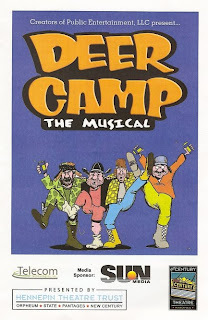 Deer Camp: The Musical is exactly what you think it is. Full of bad jokes and lame puns that frequently make you groan before you laugh, it's almost "so bad it's good." But the good news is it doesn't take itself seriously or try to be anything more than it is, with lots of winks and nods to the audience. It's meant to appeal to a certain segment of the theater-going (or non-theater-going) audience, to which I don't think I belong (I'm an animal lover, a vegetarian, and I've never touched a gun in my life). 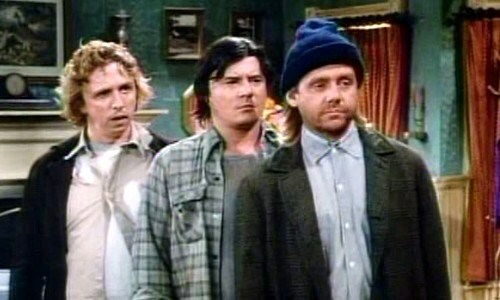 Still, as a child of 80's TV sitcoms, I couldn't resist the opportunity to see the Brothers Darryl from Newhart. While the lone speaking brother Larry (William Sanderson) has gone on to create memorable characters in HBO shows Deadwood and True Blood, first brother Darryl, Minnesota native Tony Papenfuss, has returned to his Minnesota theater roots (including The Birthday Party at the Jungle this spring). Other brother Darryl, John Voldstad, joins him for this show about four deer hunting buddies whose wives have threatened that this will be their last year unless they bring home a deer. This sets them off on a desperate quest to somehow get a deer, despite the fact that none of them has brought a functioning gun. Most deer hunters I know are able to actually hunt successfully in addition to sitting around the cabin drinking beer and telling stories, but not these guys. A few other things to note about Deer Camp: The Musical, playing now through the end of September at Hennepin Theatre Trust's newest addition, the New Century Theatre. The set is so realistic I wouldn't want to set foot in that cabin. The music is kind of catchy and clever, with more success on the country-tinged numbers which feature occasional nice harmonies. Transitions in and out of the musical numbers are less than seamless, and sadly they use canned music instead of live musicians to accompany the singers. Local actors Anthony Zadra and Ross Young join the Darryls in the cast. All four actors throw themselves completely into the material, which makes it more entertaining. They are all very enjoyable to watch. I do love Minnesota humor, and there is lots of it in this show. If you are a deer hunter, or know someone who is, you will probably relate to and enjoy this show, like the guy behind me who guffawed at every one-liner. If you're not a deer hunter (or a fan of 80s sitcoms), I can give you a few other recommendations of shows to see around town this weekend.